A wound is a break in the continuity of tissues of the body and may be either internal or external. Acute wounds usually result from external physical forces, from a child who falls off his bike and scrapes his knee, to more serious accidents. They can also occur as the result of an underlying medical problem (for instance, diabetes) or from medical treatment (like surgery). 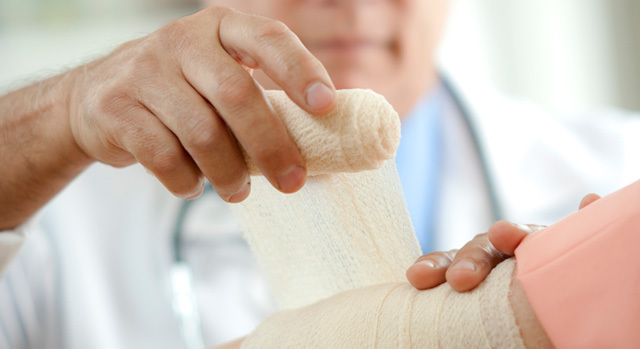 The most common types of acute wounds include abrasions, incisions, lacerations, punctures and avulsions. Acute wounds are initially treated with standard first aid. Immediately, there is a need to stop bleeding by applying direct pressure to the wound and elevating the affected limb. Easily visualized foreign objects should be removed from small, open wounds, when possible. Because open wounds are subject to contamination and infection, they should be gently cleaned and a sterile dressing applied. Tetanus toxoid should be given to those persons who have never been immunized or who have not had a booster in the past 10 years. Simple abrasions and scrapes can typically be managed by most people in the home using basic wound care. This includes daily cleaning and antibiotic ointment dressing of the wound until it completely heals, within a few days to one week. If any problems with the healing process develop, immediate evaluation by a physician should be sought. These signs include swelling, redness, sensation of heat, throbbing pain, tenderness, fever, swollen lymph glands, red streaks leading from the wound and evidence of pus. An open wound that does not show significant improvement in four weeks or completely heal within eight weeks is considered a chronic wound and requires more aggressive wound care. Typically, chronic wounds are treated through a combination of debridement, hydrotherapy and the application of special topical ointments or gels. It is important to eliminate any infection and insure adequate circulation and nutrition are being met. The most common type of chronic wound is an ulcer — an open sore or lesion often accompanied by pain, inflammation and the sloughing of dead tissue — usually caused by pressure damage to the skin. Ulcers often occur as a complication of diabetes in the form of foot ulcers. People with diabetes should have their feet examined regularly and immediately report to their physician any color changes, swelling, temperature changes, hot spots, changes in sensation, cracks, sores, ingrown toenails, drainage or odor. Dr. Bruce Hirschfeld is a surgeon with General Vascular Specialists. He is Board Certified in General Surgery with certifications of Added Qualifications in Vascular Surgery and Surgical Critical Care. Physicians are independent contractors who are not agents or employees of Summerlin Hospital Medical Center.